Beautyqueenuk | A UK Beauty and Lifestyle Blog: Titanbet - Could it be Your name Called? Titanbet - Could it be Your name Called? One of my first ever jobs while still studying was calling Bingo every weekend at Gala. It was one of the best jobs ever, I even had my own music, to let regular players at the Bingo hall know that I was coming up to call the numbers. It was almost infectious watching the look of joy on the faces of people who had won, and sometimes won big. Bingo loving runs in my family, my Grandma played right up until the day she died, like me, loving the thrill of the game. She claimed it kept her mentally alert and was always obsessed with numbers and before the invention of electronic bingo, would be able to do 12 tickets at any one time using just a biro. Years and years passed and then recently my friend and I started to play regularly, however due to her own childcare commitments we can’t go and play as often as we would like to, so when I get bored, every now and again I’ll have a bit of a play online, nothing quite like a Bingo Party. Now there are lots of sites around where you can play bingo online but personally I have registered with Titanbet Bingo, mainly because of the excellent new player offer of depositing £10 and receiving a £40 bonus (£20 bonus to play on bingo and £20 on the huge range of other games they have available) to boost my account balance. With a great welcome bonus for new players I was really excited about trying out the site - it’s additional appeal was how clean and clear the website is. Looking at competitors it can be confusing what to click, where to play and what is on offer. With the Titanbet website everything is explained in plain English, the terms and conditions of offers could not be clearer and finding a bingo room to play in just could not be easier. My Favourite room to play in is the Rainbow Riches room, anyone who has a flutter on fruit machines will have no doubt heard the cheery tones of the Leprechaun can hear him calling the numbers and announcing the winners which also makes me chuckle, one day he will hopefully be calling my name! While I have had lots of luck playing bingo in person at a bingo hall, my experience of playing online is pretty much the same. I still get the shaky hand when getting close to winning, my heart beats that little bit faster and there is certainly a surge in adrenaline. Thankfully playing at home, it means you don’t have to shout ‘House’ and a room full of people turn to look at you, it is much more dignified, though I do still shout. Would I recommend Titanbet? 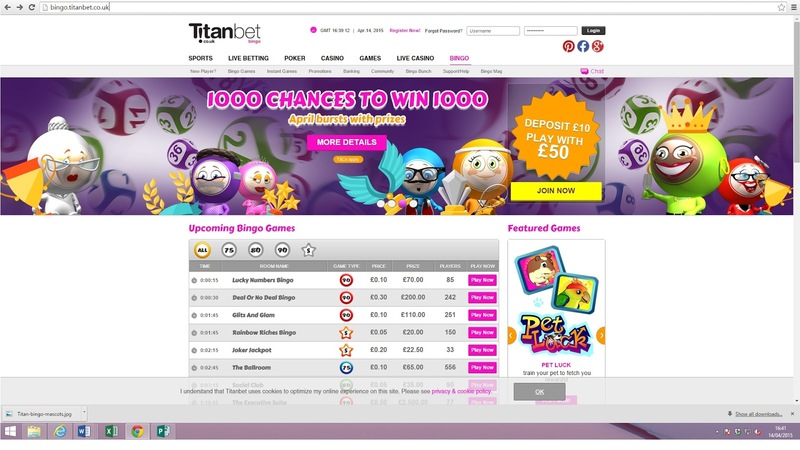 Of course, if bingo is your thing then you should take a peek at the Titanbet website. I don’t think you will be disappointed. Gambling can be addictive, and if you think your own gambling is getting out of control or it just isn’t fun for you any longer and you can’t stop then you should visit Gamble Aware, where you can be pointed in the right direction for help. I've never actually played bingo to be totally honest. I get the idea of the game but I just don't find it very appealing. This does look fun - I don't play often, but always fun when I do. That does sound like a fab job to have! I like the idea of a less complicated website, I am easily confused! The only time I have played bingo is at butlins. Online bingo sounds fun but addictive. I've played bingo online a few times, but I always think it s a bit more fun actually in the old halls - however I've never been very lucky so perhaps that is why. What a cool job that must have been - especially with your own theme tune!! I love going to bingo occasionally but I've never seen the appeal of it online - the social occasion is all part of the experience! Mummys only played bingo a couple of times, she is not very lucky!